Lily's Launch! Way To Go Chad! Sorry Lily! Fellow WoodyBoater and frequent commenter Chad Durren has finally finished and launched his beautiful Chris Craft Utility named after his cute as all get out daughter… From the photos and the beer and Brats this looks like it was a great time….And yes that is Chris Smith at the launch… Dang! You may recall WoodyBoater doing a voting contest on the font to use for the transom. We also followed the restoration from time to time. But this latest update takes the cake! What an amazing job by Chad and the Wooden Runabout Company, simply beautiful. Looks like Lily and Lily are bonded for life. What a special gift from Chad to his young daughter. To think that in 30 years she will have that dang boat out in the garage that she can’t sell because “her Dad restored it for her”. Then 20 years later after dragging the rotten thing around with her she will no doubt restore it and spend way too much money on it, because” her Dad restored it for her” her husband will leave her because she spent the “nest egg” on it… her kids will think she is selfish and why doesn’t she spend all the money on them and their education…….. Dear god Chad, get rid of the boat now and save her all that grief…mmmm let’s see… I will give you 1000 bucks for it right now, I will even come pick it up! Just think Chad. It sounds cheap now, but in the long run its a real good offer. Think of your family Chad! Think of your grandkids….The family tree sell now Chad… SELL NOW! I am here for you pal. That reminds me, I can do paypal! 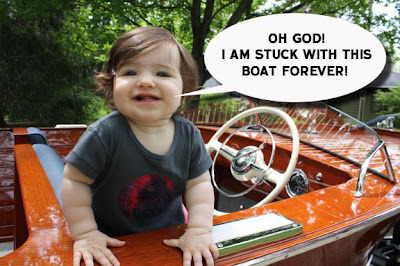 It's Always Classic Boating Season Here At Woody Boater! Not an uncommon feeling. My sixteen yo daughter decided on her 1st ride that our sportsman will end up being hers since she just looks so good in it. Some day in the future her and Lily may be at the same shows explaining that these were their dads boats. Enjoy the boat Chad! Chad, both Lily’s are increadibly beautiful. Congratulations!!! Hey, I wonder if Chris Smith would come to my launching too. You are quite honored to have him there for the special occasion. Thanks for the nice words. Kirk and Mike at the Wooden Runabout Co. do fantastic work. Credit should also go to Jeff at the Antique Boat Shop (5200 bottom) and to Casey and Dave at CD’s Engine Service. The boat has been out of the water since 1986 so getting her wet this weekend was a thrill. A few bugs to iron out but I couldn’t be happier. You can talk to Lily #1 about the resale price in about 18 years. Try this, I’ll take it off your hands for nothing, you take a charitable deduction and your wife gets to spend half of what you save by not throwing even more money at this hole in the water to keep it floating and looking good. Eeryone wins!